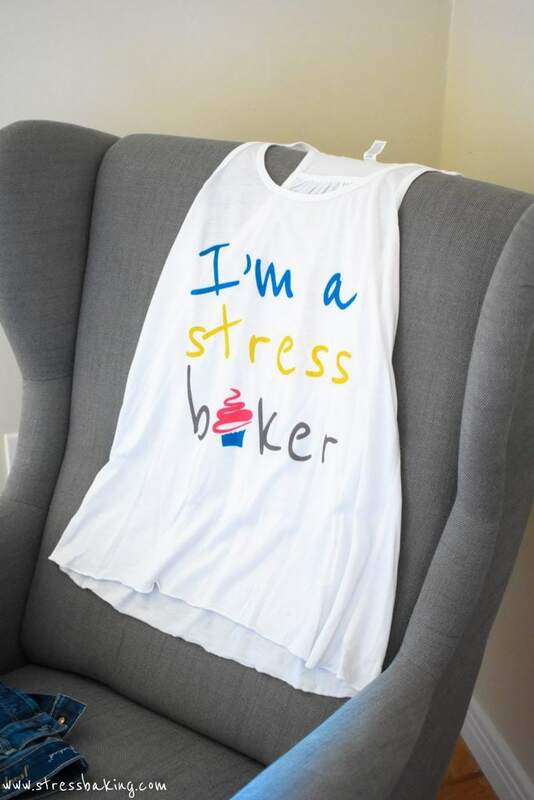 I have to tell you guys… I’ve been so touched by those of you who have ordered from my Stress Baking shop ❤ I’ve been trying to come up with the right first giveaway for a while now, and I thought giving away one of my shirts would be perfect! Those of you who are already signed up for my newsletter are automatically entered, so you don’t need to do anything else but continue to be awesome on a daily basis. I have two different designs in a variety of styles, colors and sizes – take a look now and decide on your favorite in case you win! I’m a planner, can you tell? I wanted to get some pictures of one of the shirts so that you could see what the tank style looks like on, and of course one of the cats decided that he wanted to be a part of it. Look closely in the above picture – he was in the process of licking the condensation off of a bottle of wine. All you need to do is comment on this post with your favorite Stress Baking recipe – for extra entries, you can also visit my Facebook page and follow me on Twitter using the module below. And I promise you, the shirt you would receive would be 100% cat (and dog) free. Enter below by August 2nd, 2017 at midnight – best of luck to you all! I just made some this week – it’s a go to in this house! Truth be told I’ve only made peach cobbler once, but I should do that again soon! I love the good ol’ brownies! Lasagna is SO good – and then you always have more for later! It’s peach or apple pie for me. My pleasure! And I LOVE that candy. It’s so easy and fun! Cups and Sugar cookies homemade of course! Hands down – chocolate whiskey cupcakes!! I never have to worry about storing them because they don’t last that long!! I love making strawberry cheesecake when I’m stressed!